The weather can be unpredictable at a moment’s notice. Bad weather is a task, but icy weather can be a hassle to deal with and driving in severe conditions are undoubtedly risky. Regardless of the type of vehicle you drive, it’s best to take cautionary decisions and the proper preparation to at least lessen the rough trip you will unexpectedly endure. Many tires already have small studs on them. The tires are sturdy but often swapped out for other options due to the damage they cause to roads. Before you consider using studded tires, make sure that you’re in a state that permits them. Studded tires are illegal in 10 states and the others restrict them to seasonal usages mainly for the winter seasons. Most states don’t allow non-residents to drive through with them equipped, so research on which state prohibits that kind of travel. Be sure to have studded tires on both frontal and rear axles for better handling and stability if you choose to use them. No vehicle is safe but the tires can make the difference. The right tires on your vehicle have a higher importance than the vehicle’s type itself. 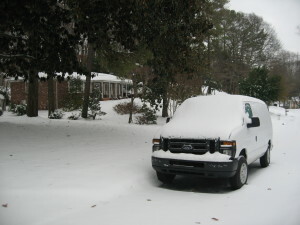 Snow tires provide a softer and smooth drive, but they can sink into the snow and ice easily. They have little traction which makes it easy to slide or for the tires to spin, especially on the occasions of driving on hills. Winter tires have deeper and wider groves that can tread over the roads, mostly useful when facing the prospect of black ice hidden along the ground. However, some vehicles are incapable of using winter tires, so talk with your dealer to understand what tires works for yours. Driving around in an empty vehicle denotes trouble, making it fairly easy to slide because there’s nothing to hold down the van. Have some items in the back of the van to even distribute the weight and better stabilize the vehicle when out on the road. The heavier, the better, and leads to an easier time handling than overturning in an empty one. A rather simple tip but can be useful in the case you find yourself stranded knee-deep in snow. Not all tires are 100% guaranteed to help through and there may be times where those winter tires are unable to pull through thick sheets of snow. Best have a shovel tucked somewhere with you to escape from being covered completely.